While other Paris neighbourhoods drift in and out of fashion, bohemian Montmartre, scattered across a large hill to the city’s north, has long been my favourite area of the city. With its unique streetscapes and reputation for liberalism, revolutionary politics, extravagant entertainment, and as the birthplace of modern art, there are lots of things to do in Montmartre, and it certainly has character. Neighbouring districts Montmartre and Pigalle are the notorious entertainment centres of Paris, and some of the liveliest bistros and restaurants are found in these areas. One of the city’s icons, the Moulin Rouge (red windmill) is where the can-can dance was created. While nowadays the dance seems rather too fast-paced to be seductive, at the time of its introduction seeing a woman’s undergarments was the height of excitement and hedonistic entertainment. Following the Moulin Rouge cabaret’s success, cabaret shows were launched across Europe and these days the venue continues the tradition, with shows for tourists. While movie buffs may enjoy seeing the inspiration for Baz Luhrman’s ‘Moulin Rouge!’ they may also be interested in a less conspicuous site just around the corner. Moulin Rouge was not the only windmill in Montmartre. Fourteen others worked together and were known as the Moulin de la Galette, on account of the brown wheat they produced (perfect for making galettes!) Two remain in Montmartre, hence the name of the café. Le Café des Deux Moulins is located on the corner of Rue Lepic and Rue Cauchois. It featured as the workplace of the title character in the quirky movie Amelie and serves a mean crème brulee. 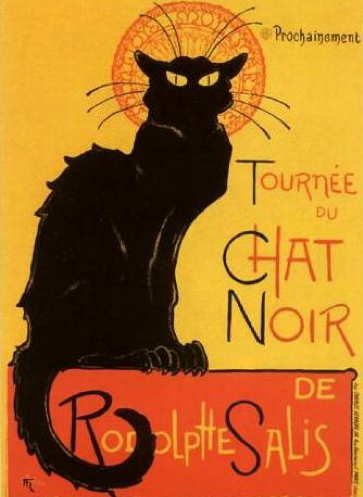 Even if you're not sure what it means, you're bound to have seen Theophile Steinlen’s poster for ‘Tournee du Chat Noir’, which has become a Paris icon. Le Chat Noir (the Black Cat) is considered one of the first cabarets. The venue provided raucous entertainment such as satire to its largely working class guests in an open-stage style and regularly mocked bourgeois morality. It proved so popular it had to expand its premises, forcing two relocations. The first location, where it all began, was at 84 Boulevard Rochechouart and is marked with a commemorative plaque. The club then moved to 12 Rue Victor-Masse. It’s final locations was 68 Boulevard de Clichy which is now a bistro and hotel of the same name. A few streets below the Montmartre hill is the Jehan Rictus Garden Square, containing the Wall of Love (le mur des je t’aime), created in 2000. The wall is large (roughly 5m wide by 4m tall) and the phrase “I love you” is scrawled across it in 250 languages. The small garden is a lovely spot to sit and enjoy the wall, while trying to find “I love you” in your mother tongue! One of the many rewards of mounting the numerous Montmartre staircases is a visit to the Place du Tertre (or the hilltop square), one-time gathering place of artists that went on to create some of the most notable art of the 20th century. Many notable artists lived or worked in Montmartre, including Dali, Monet, Renoir, Picasso, Toulouse-Lautrec and Van Goph. Keeping Montmartre’s artistic connection well and truly alive, today’s artists display their work on the square and paint portraits of tourists under the shadow of Sacre Coeur. The square is lined with street-side cafes, and is a wonderful spot to relax and people-watch. Just around the corner from the Place du Tertre is the Dali Museum, which is an underground museum showcasing over 300 of Dali’s works, including watercolours, drawings and bizarre pieces of furniture. Elements that inspired Dali are featured alongside some of his creations, providing an interesting insight. The museum is small but, for many, is a popular introduction to Dali. 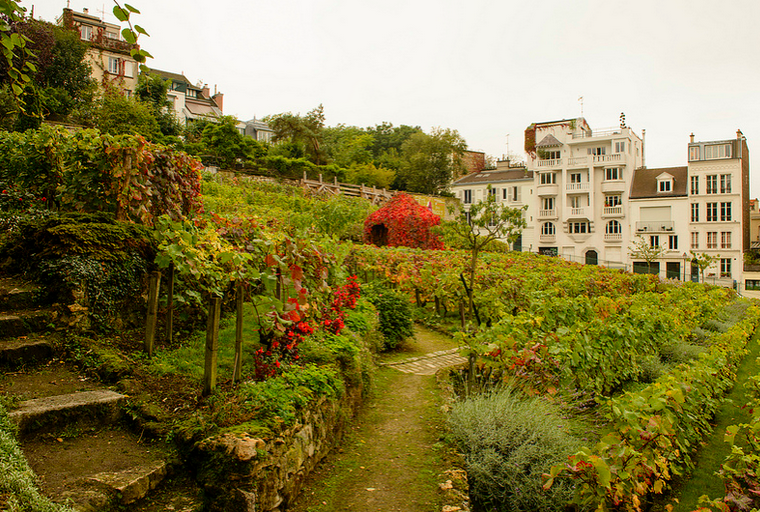 The presence of vineyards in France’s capital city, reminds visitors of the national obsession: wine. One of the most famous of Paris’ city vineyards, Montmartre Vineyard (Clos Montmartre) has been producing wine on Rue Saint-Vincent since the 1930s. Surrounded by city houses the neat little vineyard, lined with turf and lavender, is very picturesque. It is small, producing less than 1,000 litres of wine annually but, while expensive, the proceeds go to charity. To explore a bit of Montmartre’s human history, where better to visit than the cemetery? Many of Montmartre’s famous characters are buried in Montmartre’s densely packed but atmospheric cemetery, from internationally renowned artist Edgar Degas, to more recent resident, director and screenwriter Henri-George Clouzot. They are accompanied by composers, archaeologists, scientists, writers, performers, historians, poets, and politicians, and are frequently visited by cats. The spectacularly pretty Sacre Coeur Basilica is a Roman Catholic church that positively shines as it sits atop Montmartre hill, the highest point in Paris. Completed in 1914, and consecrated in 1919, the white stone structure that took 40 years to build sits in stark contrast to the buildings around it. Inside, the basilica is decorated with one of the largest mosaics in the world. It is possible to climb to the dome, but even from the verandah in front of the church there is a magnificent view across the whole of Paris, and you can make out all the famous landmarks. To the west side of the main paths leading down the hill from Sacre Coeur is Rue Foyatier. The much-photographed, and steep street is one of the most famous streets in Paris, and is especially characteristic of Montmartre. It is simply flights of stairs and lampposts. The Montmartre funicular runs up and down the hill parallel to the staircase. If Montmartre’s various boutiques have not tempted you into a purchase and you need some souvenirs Rue Steinkerque, leading away from the base of the Sacre Coeur hill, is lined with shops selling all sorts from retro prints and high-end biscuits to the more kitsch Eiffel Tower keyrings and snowglobes. It is easy to see why Montmartre’s quirky streets inspired artists and entertainers. Montmartre’s streets burst with character and bohemian spirit, and, I’m confident, will continue to lure visitors for a long time to come. Which is your favourite Paris neighbourhood?